Possibly you have never changed your own oil, or even lifted the hood of his car. But every 5,000 miles or every three months, whichever comes first, you should change the oil in your vehicle. And if the idea of ​​getting under the chassis of your car and doing it yourself does not appeal, then it is inevitable to a workshop. That's why our experts have put together this short list of tips to shed some light on what to expect when you take your car to a factory marking as San Borja Services. What is an average price for an oil change? Prices may vary, depending on your location, the average price of an oil change fluctuates. This usually includes checking and topping off other fluids (windshield washer, brake fluid, the transmission fluid) and the revision of the tire pressure, if necessary. The recommendation is to change your car's oil and oil filter every three months or every 5,000 miles in normal driving conditions. You should consult your owner's manual for specifications recommended by the manufacturers for your car, which may vary slightly. The owner's manual recommendations will have normal and severe. Severe driving conditions include driving in traffic (stop and go) or excessive time have stood, often make short trips (less than 5 miles per trip), driving in extreme temperatures and a trailer or moving. The average driver probably considers regular handling, but the truth is that most drive under severe conditions more often than we realize and should do the oil change accordingly. However, conform to the rule of 3 months / 5,000 miles is considered a minimum interval required to drain and for maximum performance of the machine. What kind of oil should I be putting my car? Remember, consult your owner's manual for the manufacturer's specifications for your vehicle. That way, you will be able to tell the mechanic what type and grade of oil you want. Most manufacturers recommend a grade motor oil and conventional, for example, 15W40, but the temperature is in the surrounding area could require the use of a different grade. For example, if you are living in a hot climate, you can use a heavier oil, such as 20W-50. In a very cold climate would suggest using a slightly less heavy oil, such as 10W-30. Use high quality oil like Castrol, and for this you must ask specifically, or otherwise you going to get your self a "Oil of the House." Unless you go to the service centers where only used Castrol. Do I have to use the most expensive brand of oil? Of course not. The most important thing is to use the right one for your car. There are three types of motor oils and each different benefits. Conventional motor oil, such as Castrol GTX, will give excellent protection. Synthetic oil, such as Castrol Sintec, offers the ultimate in engine protection. A synthetic blend product, such as Castrol Magnatec, offer additional protection, but at a lower cost than fully synthetic oil. Once you know your options, you will be able to decide on which is best for your car, but in general, the right oil does not have to be the most expensive. 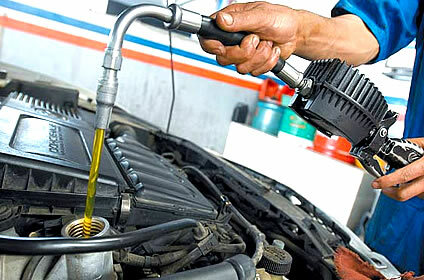 Change your car's oil is relatively fast and is a very simple operation. If an oil change is all your car needs, there should always be someone on hand to do it, except that there is a possibility that it is an extremely busy day in the shop. How long will the oil change? The current process oil change should take no more than 20 minutes, assuming this is the only service that the mechanic will. If I do my oil change on a "Workshop on Rapid Oil Change", will not cancel my warranty? No, but if your car is fairly new, your warranty may include oil changes by the dealer up some mileage. Check your warranty to see what benefits the service can be included in your vendor. Should I change the air filter every time I change the oil? No! This is an old trick. Do not fall. An air filter change may only be necessary after 10,000 miles. Check the service manual for your car. An unscrupulous mechanic can also insist on changing windshield wipers. It's another scam. When you ask for an oil change, should be the only service required, unless you ask for another.